Wow. Just wow. 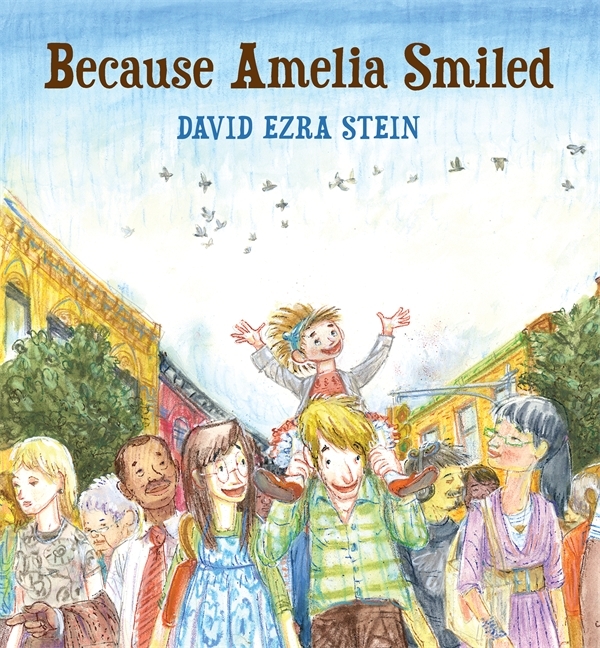 That's all I have to say after reading Because Amelia Smiled, by David Ezra Stein, author and illustrator of the Caldecott Honor winner and story time (and bedtime) favorite, Interrupting Chicken. I have to confess, since Interrupting Chicken came out in 2010, I have been hoping for a repeat from Stein. That's just human nature, I think, to want more of what we love. While Because Amelia Smiled is not even remotely Interrupting Chicken Returns, it is something equally wonderful and all together amazing and wonderful. The dedication reads, "To you: Pass it on!" Because Amelia Smiled is a circular story that takes readers around the world while a the same time showing the interconnectedness we share as humans. The book begins, "Because Amelia smiled, coming down the street . . . Mrs Higgins smiled, too. She thought of her grandson, Lionel, in Mexico and baked some cookies to send to him. Because Mrs Higgins baked cookies . . ." From there readers travel to Mexico, England, Israel, France, Italy and back to New York City. While the trip around the world is exciting, what is more compelling are the ways in which the people in the story think of others and take notice of those around them. Some flights are due to creative inspiration, some are do to feelings of good will, some are a reaching out to loved ones from the past. Some of the flights come from one person observing another. A pizza maker in New York City watches a woman in Italy walking a tightrope and tossing roses to the crowd below. On the subway home, she is inspired to knit a scarf of red roses for her niece. A man across from the knitting woman is reminded of his grandmother who knit and thinks of her as he releases his pigeons from a rooftop. What really makes this story superb is Stein's illustrations. Layered and detailed, the illustrations are reminiscent of the vibrant, urban art of Red Grooms with a bit of the movement and playfulness of Tibor Gergly thrown in. Stein keeps his palette the same throughout the book, highlighting the connection that we all have. His illustrations are packed with people and action, making the world feel large and small at the same time. 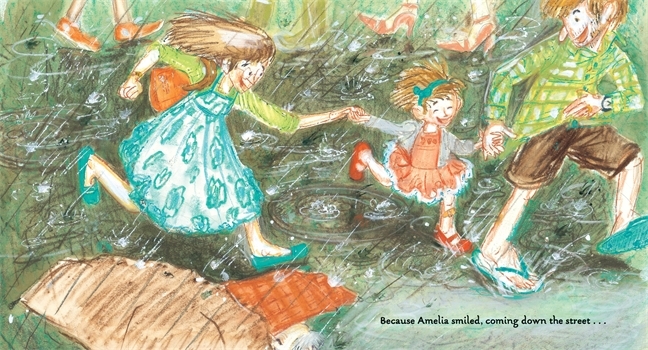 Oceans are crossed with the turn of a page, but the characters in Because Amelia Smiled are connected by the small things in this world that are often and easily overlooked - a song, a dance, a smile.